I could have titled this: How one thing leads to another and I end up with this painting. Or: How my failure to plant bulbs leads to a small success in learning to paint light. Either way, I had intended to plant 80 daffodils this fall, but only 60 went into the ground before an early freeze thwarted me. The thought of those 20 unplanted bulbs sitting in my basement has been nagging at me, so I bought an amaryllis in hopes that it would lessen the disappointment. Unfortunately, the amaryllis had already started to grow in the box—sending up a ghostly, stunted stalk. I rather liked the dried roots and the shape of the thing, so I painted it here, followed by the daffodil bulbs. And though there’s nothing spectacular about this page, I am pleased to have put my angst on paper, and I especially like the light-filled quality of the final bulb in the upper right. 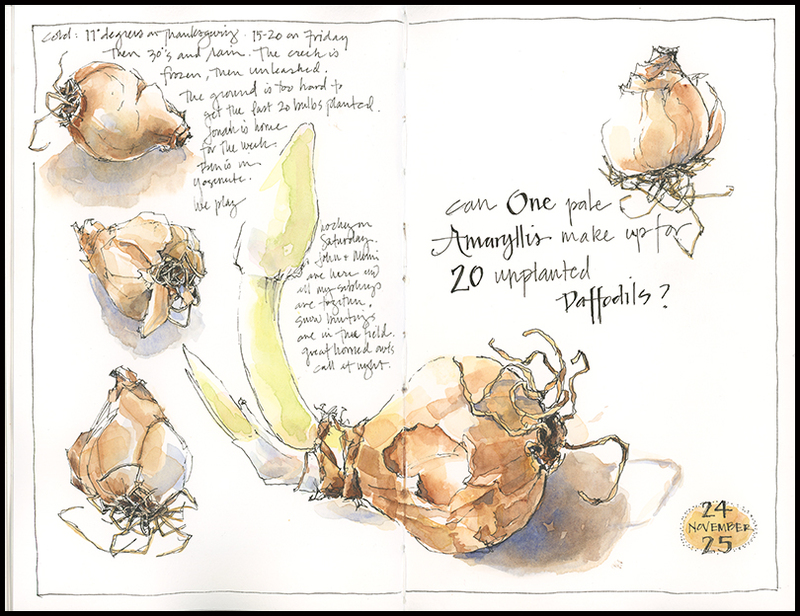 This entry was posted in Garden, Journal and tagged bulbs, garden, sketchbook, watercolor sketch by Jean Mackay / Drawn In. Bookmark the permalink. I like this page for promise of spring, why not plant all the bulbs in pots so you can enjoy the daffodils indoors, probably long before they bloom in the garden! I will likely have to do that Valerie, unless we get a warm day or two and I can shove them in the garden. I enjoy your storytelling as much as your painting, Jean. Thank you. Thank you! I appreciate your note. Jean, I always enjoy your “postings” ! I still am enjoying the Killdear drawing that I got from you. With best wishes for the Holidays. Hi Dane- How nice to hear from you– glad to know you’re still enjoying Drawn In! Plant them indoors and enjoy the show earlier than ever, Jean! Maybe you can paint them as they grow for a spectacular time-lapse series in the journal. I love watching you work. Thanks Mimi– I didn’t want to have to find pots and soil and such. Much easier to have them do their thing outside, but I may have to force them indoors. Get digging! I thought I’d have at least one more decent weekend. But perhaps a bit of sketching is warranted first! This story makes me smile. I should be thankful that a freeze is unlikely here, so the daff bulbs sitting in a storage bin outside can still go in – when I get to it! I remember planting them in December in Connecticut, near the coast – whole different climate than yours, right? Even though it’s not so far away. And the amaryllis bulb – I’ve seen that happen, too, I admire you for just painting all of them. I like the empty area on the left – the light – on that one bulb. You’re right, you were given an opportunity to shed some light on these bulbs, as long as they’re not under the earth. Now I hope we’ll have an update on that amaryllis! I’m wondering how long before it greens up. The CT coast is zone warmer than here. And I think some years you could plant in early December here, too. But not this one. We are swinging between January and March: mud, ice, rain, wet oak leaves, snow. I really do need a new attitude! Time to get out the sketchbook! 🙂 I had to laugh, but I do feel bad for you. Well, one thing to remember is that Spring will be that much sweeter after a touch, long winter. I feel bad for me too!